Matt Hilton Thrills: SEMPRE VIGILE PRESS - a new venture for Me. Here's some news on a few projects I've been working on for quite some time. Most of you here know me as the author of the Joe Hunter thriller series. Others also know that I write other stories in different genres - primarily that of horror under various pen names (Vallon Jackson, Jack Norton, J A Norton). I'm one of those authors who can't bear NOT to have a book on the go. Therefore when I'm not writing the latest Hunter thriller, I will work on other standalone books. Now, then, when I've offered these books to publishers, there has been a little problem that gets in the way. The 'Matt Hilton" brand is infinitely connected to Joe Hunter, and there is no desire to cause confusion either for the buyers or readers of Joe Hunter's adventures, so my publishers have politely declined to bring out the stand alone books, though I've received their blessing to bring them out elsewhere. I'm going to bring out my books as eBook originals, through my own self-publishing efforts called SEMPRE VIGILE PRESS. If demand is large enough I may look into the possibility of bringing out hardcopy editions - unless some nice horror publisher is reading this and makes me an offer. A few weeks ago I published a young adult horror novella under the pen name J A Norton called 'Deliver us from Evil', primarily as an exercise into the hows, why, and wherefores of self publishing an eBook, while also working to get ready my first full length adult novel. My first stand alone horror/thriller is called DOMINION, and it is now available through Smashwords.com to the US market, as well as all Amazon platforms. Spec-Ops soldier, First Sergeant Ellis Kirby leads a JSOC unit into the Tora Ghar cave system in Afghanistan in search of WMDs, but finds something much worse. Infected by an ancient power summoned by an evil cleric Kirby and his companions are whisked back to secret military laboratories in the US. The plague of creatures - known as rakes - that is subsequently unleashed threatens to wipe out the entire population of the United States and perhaps the world. Kirby wakens in his room to discover that everyone in the lab has been slaughtered, and the monstrous flesh-eating creatures are loose and rampaging throughout the land, killing and propagating their species with abandon. Through a country rapidly overwhelmed by the ravenous creatures, Kirby aims to return home to his parents’ farm in Iowa, but on his return – following a perilous cross country journey through rake-infested lands - he discovers that they are dead, so chooses instead to take the fight back to the monsters and their master. Across the same devastated landscape travel Bree and Jill Adams, sisters at odds, who must face their past to survive the future, and three misfits collectively known as the Ruby gang. Each must endure their travails before all of them are thrown together, and then with Kirby, in a race to the eastern seaboard where the final conflict between man and beast is destined to play out in a battle encompassing modern warfare and ancient magic. The book isn’t a techno-thriller; it focuses on the human stories, and the terror of the plague seen through the eyes of the central characters, and is one of fear, horror, hatred and violence, but also of adventure, humour, courage, loyalty and hope. It runs at over 175 K words, so is quite a hefty read. 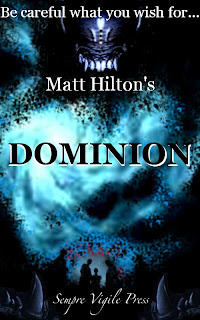 One industry insider has described DOMINION as being like "28 Days later" meets "Aliens", an accolade I'll gladly take. Hope you enjoy my first venture into self-publishing. I meant that i hope my blog nets you at least a few sales, not the book itself. I have no doubt that it'll be a hit! Cheers paul. yeah, i got your meaning, bud. Many thanks for spreading the word. All the sales it can garner will help. It's about time these other ventures of yours got the chance to be enjoyed!! Good luck with it. Also watch out for 'Darkest Hour' coming soon. Ludis Kristaps agogo. I love the sound of this book Matt. Due to the size I think I may treat myself later on and read it as my Christmas book over the holiday. Good luck with it and the other stand alone novels you have planned. My thanks, Anthony. Hope you enjoy Dominion and it keeps you entertained.